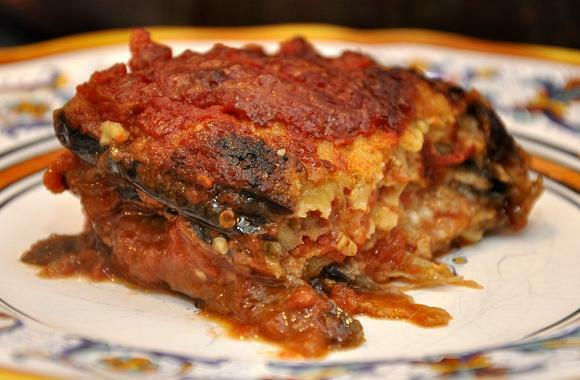 Even if you normally don’t like eggplant, I am hoping that this eggplant lasagna recipe is exceptional. I’ve had other gluten-free options but rice, corn, quinoa, and buckwheat pasta is expensive – even more so than regular pasta. And they are not readily available at my local health food stores. If you have a serious aversion to eggplant, you can use other gluten-free alternatives. I ,however, am trying to watch my waistline and felt I had more than my fair share of carbs for this week. This gluten free eggplant lasagna dish is satisfying but not too heavy. It comes close to what you would expect from a authentic classic Italian lasagna but without the excess amount of carbs. If you want a vegan option for this eggplant lasagna recipe, you can omit the cheese entirely or use a vegan substitute. Preheat oven to 350 degrees F. Place sliced eggplant in on a baking sheet. Lightly brush eggplant with olive oil and season with salt and pepper. Roast in the oven for 10 minutes or until tender. Add the remaining 2 tablespoons of olive oil in a skillet over medium high heat. Add onions and saute till translucent. Add minced garlic and saute for another two minutes. Add the vegetables and saute until tender. Add the ground meat and sauce and cook for 5-10 minutes. Mix Parmesan cheese and ricotta cheese in a separate bowl. Layer the lasagna in a greased baking dish in the following order: sauce, cheese mixture, eggplant, cheese mixture, sauce and then top with Mozzarella and cheese. Bake for 30 minutes or until bubbly. This entry was posted in Dairy, Gluten Free and tagged eggplant lasagna recipe, gluten free lasagna, low carb dinner ideas.